My interests fall in the intersection of theoretical and computional linguistics. 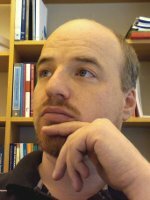 I try to give solidly empirically founded answers to linguistic, mainly syntactic, questions by using corpora and computational methods. I defended my dissertation on a corpus investigation of constituent fronting in Dutch in 2008 at the University of Groningen. Currently, I am a post-doc at the Institute of Swedish at the University of Gothenburg. My home page contains more information about me and a full publication list, with downloads and links. Publications related to the University of Gothenburg/Spraakbanken are listed below.